Industrial Air has expanded their range of high-performance compressors with this excellent high-capacity model. The Industrial Air ILA3606056 60-Gallon Hi-Flo Single Stage air compressor is one of the most reliable units in production. It has been heralded as one of the quietest large compressors available. Let’s take a look at why Industrial Air is known as one of the best manufacturers around. The Industrial Air ILA3606056 60-Gallon carries a hefty 228 pounds of weight. It is still however smaller and lighter than most other competing options. It is lightweight enough to be transported by one person, although a fixed point of operation is highly preferred. The powerful 3.7-horsepower motor fills the sixty gallon tank in just under six minutes. This excellent rate of pressure translates to 11.5 CFM at 90 PSI. The duty cycle is outstanding, allowing for long durations of pneumatic operations. At 40 PSI the ILA3606056 is capable 13.4 CFM, adequate for two air powered tools. The 240 volt induction motor uses splash type lubrication to give long-lasting performance and a lengthy duty cycle. This compressor is great for all tools that require extensive periods of continuous use. 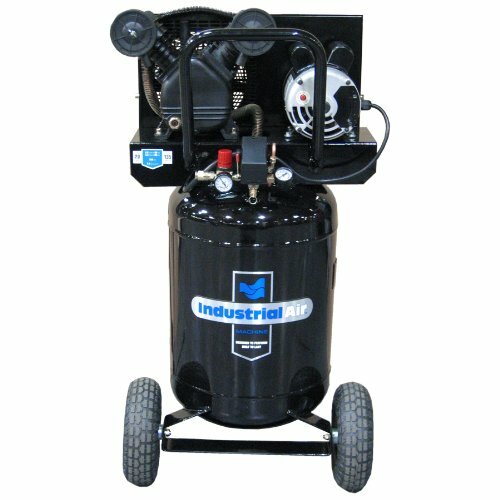 The cast iron pump that runs this compressor is durable enough to last for many years of service. It requires oil lubrication, however the oil level is easy to read and the oil fill is quick to refill. The compressor ships standard with synthetic oil which benefits the longevity of the machine itself. As an industrial-class air compressor, the ILA3606056 is one of the quietest currently in production. It is designed for indoor use and consequently makes very little noise for a compressor of it’s size, comparable to that of portable air compressors. The Industrial Air ILA3606056 60-Gallon is supplied stand-alone. You will need to buy a regulator, hoses and a power cord. Both 208 and 240 volt operation is supported without a change of wiring being needed. The long length of this unit’s running time makes it perfectly suited to medium-to-large scale industrial use. Dedicated DIY enthusiasts will find the Industrial Air ILA3606056 a great addition to a cutting-edge workshop. The affordable pricing places this air compressor within the reach of both demanding professionals and discerning home users. 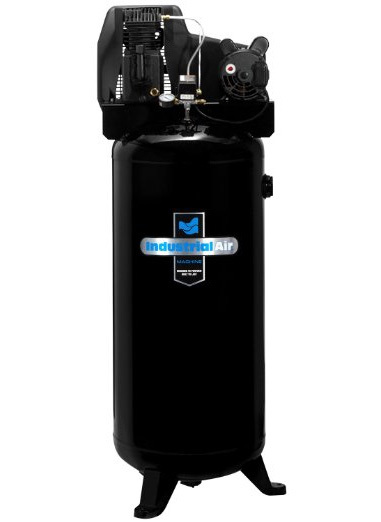 If you use an air compressor frequently and need a continuous duty cycle that exceeds what is conventionally provided by portable compressors, then turn to the Industrial Air ILA3606056. Clear to read pressure gauges, superior construction, a long running duty cycle and low pricing make the Industrial Air ILA3606056 60-Gallon Hi-Flo Single Stage the perfect choice of compressor for any user that demands the best.